What is a low-flow shower head or faucet? 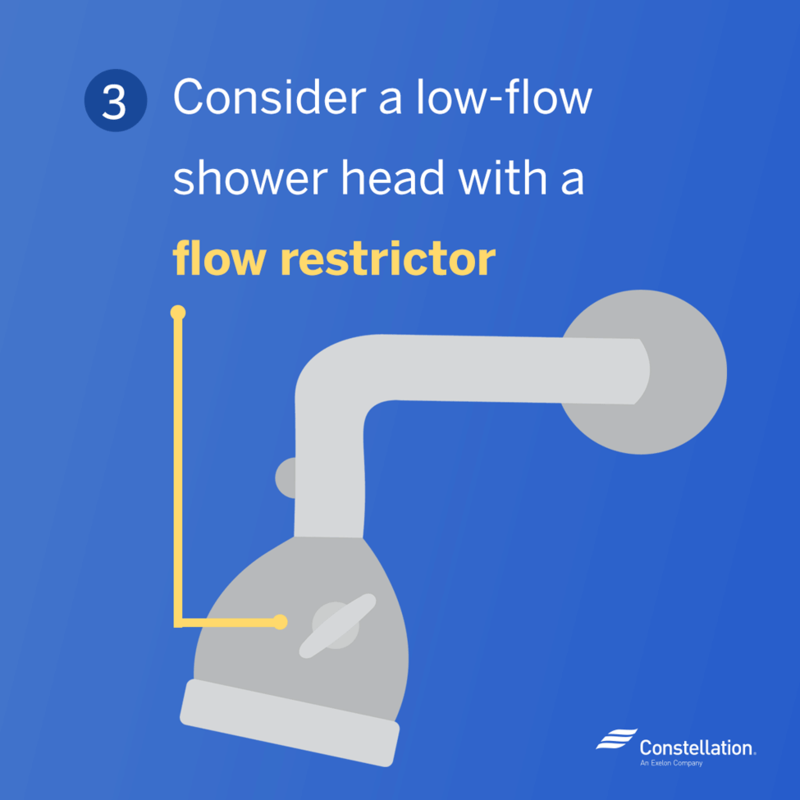 What is a low-flow shower head? It’s a shower head that is designed to reduce the amount of water that is wasted in order for your home to be more water-efficient. Shower heads can’t control whether you’re taking a long, luxurious shower of course, but they can help reduce your water heating costs. In fact, water heating is the second-largest energy expense for the average home. For most homes, this is about 15% of your utility bill after heating and cooling expenses. It’s not just showers — hot water is used in washing machines and dishwashers too, and there are ways to cut back when using those appliances as well. For example, washing your laundry in cold water can save you up to $60 per year. And, an energy-efficient dishwasher helps too. Still, if you’re taking the average eight-minute shower per day, you’re probably using over 17 gallons of water each time. This flowchart can help you dissect even more of your shower habits. Taking that into consideration, then, there are good reasons to invest in water conservation. 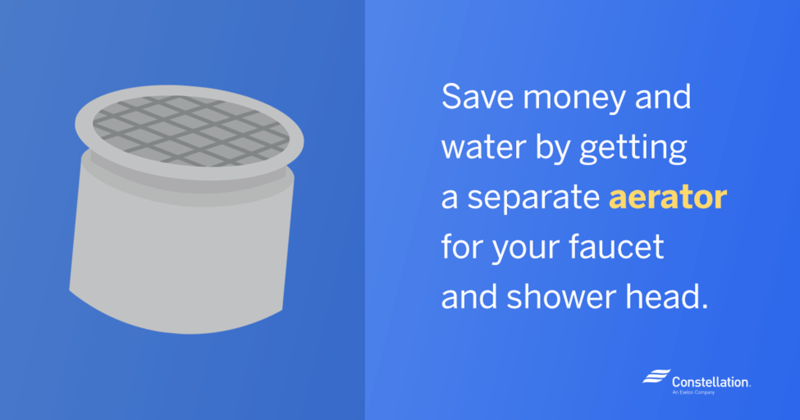 Shower head and faucet equipment that can work towards more energy-efficient showers can actually help save some money. Understanding what a low-flow shower head is and how to pick the best one can go a long way, so keep reading! 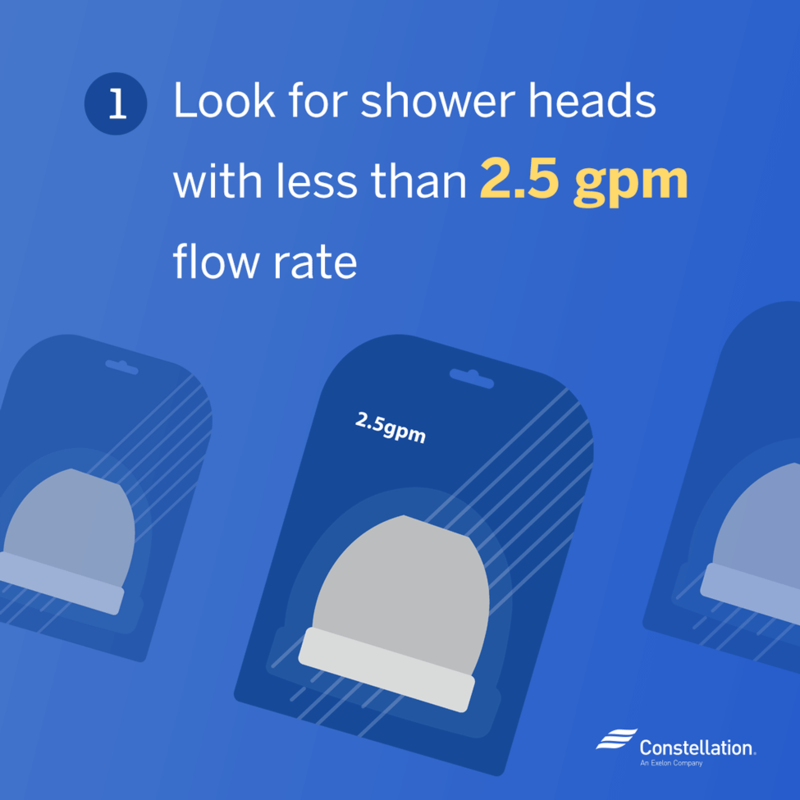 Select a shower head with less than 2.5 gpm (gallons per minute) flow rate. 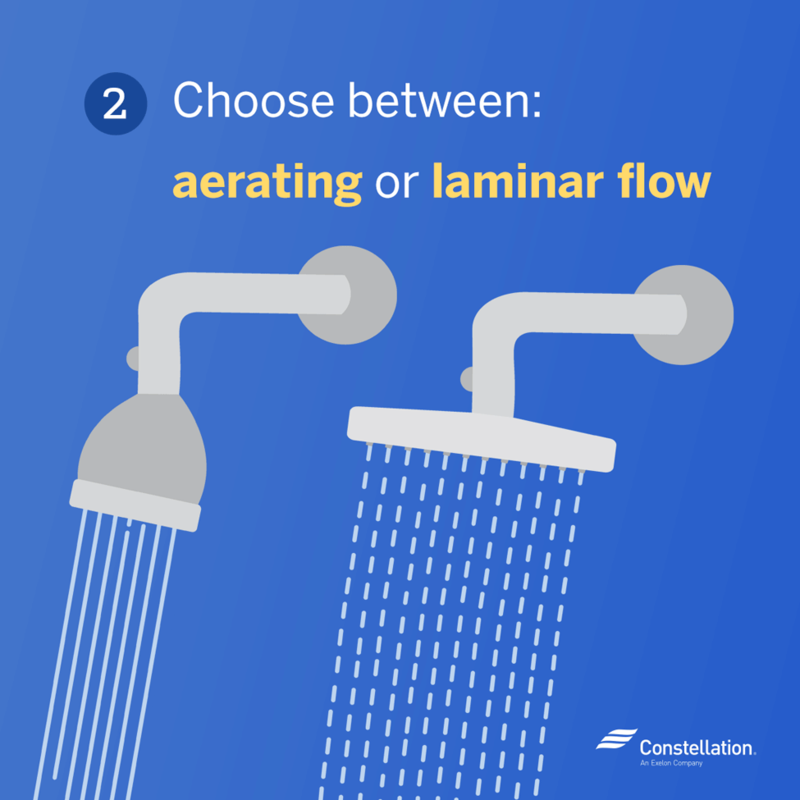 Determine if you want an aerating or laminar-flow shower head. Aerating means that the water is mixed with air, which would make a mist-like spray. Laminar-flow is a shower head that has individual streams of water. Often, the best low-flow shower heads include a flow restrictor. A flow restrictor allows more or less water through the lines so that you can control the amount of flow you need based on your water pressure preferences. Before you even begin to shop for energy-efficient shower heads, though, there are a few things that you should know. First, what is the flow rate for a shower head? 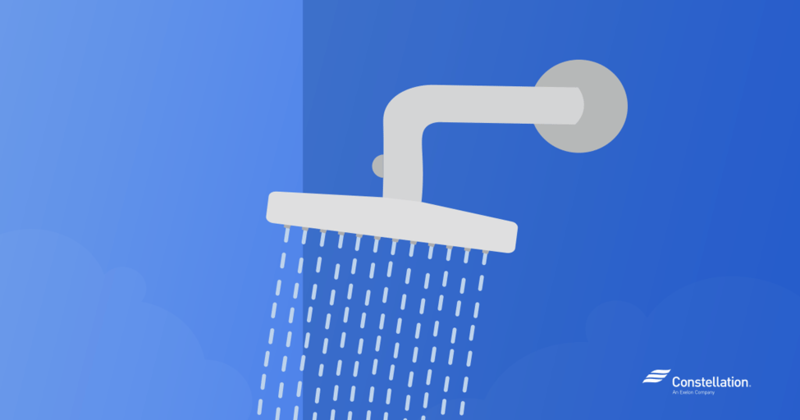 It used to be that a shower head would deliver five to eight gallons of water per minute. But… if people were taking eight-minute showers… 64 gallons per shower?!? So, federal regulations now mandate that a shower head can’t have a flow rate of more than 2.5 gpm, with water pressure of 80psi (pounds per square inch). What is the flow rate for a shower head? Use a one-gallon bucket (or one that has markings at each gallon point) and place it under the shower head. Time the number of seconds it takes to fill the bucket to one gallon. A true low-flow shower head should take 24 seconds or more to fill a gallon bucket. Why are energy-efficient shower heads important? Water conservation protects valuable drinking water resources. Although there is water all over the planet in the form of oceans, humans can’t drink salt water unless it’s been through an extensive (and expensive) desalination process. Fresh water is a valuable resource, and contaminated water is a problem in parts of the U.S. and elsewhere in the world. When you use a lot of water, it strains septic and sewage systems, which could contaminate groundwater. When untreated, dirty water seeps into the ground from sewage, and that can mean less clean water for drinking. Clean water will cost the taxpayers. The city or municipality where you live will need to plan for new ways to produce clean water over time, and ultimately that cost will trickle down to the taxpayer. Of course, a discussion on the best low-flow shower heads wouldn’t be complete without also mentioning how to choose the best low-flow faucet for your bathroom or kitchen sink. The reasons are the same — while your first priority should be trying to actually run the water for less time (for example, not running water while you’re brushing your teeth or shaving), there are ways to cut down on your water use, even when it’s necessary to run the faucet. The Environmental Protection Agency (EPA) runs a program called WaterSense. One way to know that you are choosing low-flow faucets is by selecting a model with the WaterSense label. A WaterSense certification is similar to an EnergyStar rating on other appliances, in that the items are backed by third-party certification and meet EPA standards for water efficiency. WaterSense-labeled low-flow faucets can be up to 20 percent more efficient than other models. In fact, they are so efficient that they could save up to 300 kilowatt hours of electricity, which could run your TV for a year! As with any appliance, there’s a range of styles and costs, so how to choose the best low-flow faucet will depend on your budget and the features that are important to you. For example, there are some that use motion sensors to automate water flow, and others that have automatic shut-offs that can turn off the water after a certain amount of time or water flow (an auto-shutoff on energy-saving shower heads could be a big benefit to parents of teens who need prodding to take shorter showers!). There are even some low-flow faucets that can be controlled by a foot pedal. Here’s another tip for energy-efficient shower heads and low-flow faucets: If you want to save money and water but don’t want to purchase and install brand new fixtures, you can also purchase a separate aerator. There are WaterSense-labeled aerators on the market, and they only cost a few dollars — far less than purchasing new low-flow faucets or water-efficient shower heads. An aerator can be easily installed on the faucet or shower head, and it can be one of the most effective ways to increase water conservation. Shower head use can be made more efficient, specifically, with an aerator that has a 1 gpm or less flow rate. There are lots of ways to save energy and water, so share your tips and tricks in the comments! Remember, water conservation benefits us all… and the next generations. Being conscious of energy-saving shower heads, low-flow faucets and other small changes in your home can make a big difference to your budget and our natural resources. Like your (this) website on saving energy through changes made to increase efficiency and decrease cost. Very informative and potentially useful, but a comparison of costs applied to the before and after would, I feel, make the message more applicable or not, to one’s own situation. Your comment on using an “aerator” before committing to a purchase of a new faucet/Head, was illustrating a “less costly” approach to judge the effect of such a larger change in equipment.